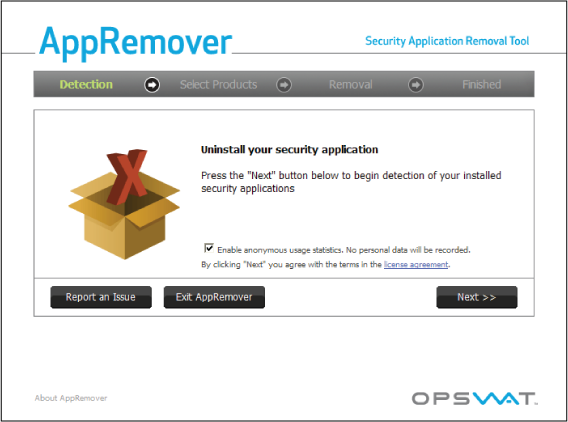 OPSWAT, Inc., the leading provider of endpoint security integration technologies to software developers and vendors, recently reached a major milestone as its AppRemover uninstallation utility--the premier stand-alone application for uninstalling antivirus and antispyware applications—has now exceeded 500,000 downloads. AppRemover for home use, which received four-and-a-half stars from the editors of CNET, presents the user with an easy-to-use interface, thus making the sometimes tricky act of removing security applications simple. The automated analysis and removal process eliminates the need to go sorting through complicated registry entries. In addition to the free utility, the commercially-licensable AppRemover SDK has now seen successful deployments to a number of organizations including Continental Airlines, the University of Dayton and Catawba College. The product has also been licensed by antivirus vendor AVG Technologies to distribute as an important support tool. AppRemover is a software utility and SDK that enables the complete, silent uninstallation of security applications (from vendors like Symantec, McAfee and dozens of others) from any computer. This lightweight utility is a community-based tool that has been developed by OPSWAT Labs and shaped based on the feedback that OPSWAT receives from users. It offers myriad benefits to developers. When Should AppRemover be Used? Founded in 2002, OPSWAT provides software engineers and IT pros with development tools and data services to power manageability and security solutions. OPSWAT, Inc. created OESIS OK, an industry-wide certification program that verifies the interoperability of endpoint security applications with products from market-leading technology vendors. The free Am I OESIS OK? utility hosted at http://www.oesisok.com/ enables end users to assess the interoperability and quality level of their applications.